As you may have read, we were away last weekend so the fridge was a little bare when we returned Monday. Normally I do the shopping on Mondays but this week has been crazy with real estate work (I can hear some faint cries of “about time you did some work”). I’ve got a couple deals scheduled to close at the end of the month and some other business development so I’ve been hopping around making sure everything is in order. Needless to say the groceries had to wait a bit. When I did get to the store it was late in the day yesterday and since we were in desperate need of going to the gym (hang on, I mean I was in desperate need) after a weekend of DC debauchery I needed something not too complicated for dinner and decided pizza would fit the bill. Trader Joe’s used to sell pizza dough in a bag (they may still do) where all you had to do was pull it out, dust it with some flour and knead, bake, put toppings on and finish baking. In 20 minutes you had a pizza. It was great quick weeknight dinner. Since I make my own bread these days I also make my own pizza dough. It adds time of course but you can make the dough earlier or the night before and have it ready for when you get home. Anyway, I like this pizza with cheese, artichokes, and red peppers. Cheryl does too. Of course, you can put anything you want on your pizza once you have the dough. For the dough I use a 5:3 ratio of flour to water. This way you can make any amount of dough you want. Smaller – go with 10 oz flour, 6 oz water; more dough – 20 oz flour, 12 oz water. I don’t make a thin crust pizza but I don’t make it thick like a slice of Sicilian (you do know what Sicilian style pizza is right? tell me it exists outside NY). Mine is kinda in the middle. This dough recipe makes a fairly large pie, enough for 6-8 slices depending on how big you make them and how thin you roll out the dough. I try to roll mine out to 1/4″ thickness. You don’t have to use my dough recipe either if your local grocery store has some pre-made pizza dough. Combine water and yeast, mix well. Add the flour and olive oil. If using an electric stand mixer use the dough hook and run the mixer for about 10 mins. after it’s all mixed to knead the dough (if no mixer use your hands). Let it rest for 50 mins. Punch down the dough and allow to rise again for about 45 mins. Flour your counter or large cutting board. Put dough on board and with a rolling pin roll out to desired size and thickness. You can also do what you saw all the pizza makers do and pull it out with your hands and toss/spin it up in the air then roll it out. Yeah I do this. Go ahead, you know you want to, pizza is supposed to be fun. When you had your dough all rolled out prick the dough with a fork all over in order to try to prevent big bubbles from forming (I always forget this step). Sprinkle some salt on your dough. If you have a baking stone in your oven go ahead and slide the dough onto it and bake it for 10 mins. If not put the dough on a baking sheet, place it in oven and bake for 10 mins. or until it starts to blister and the edges brown a little. Take it out to put on the toppings. 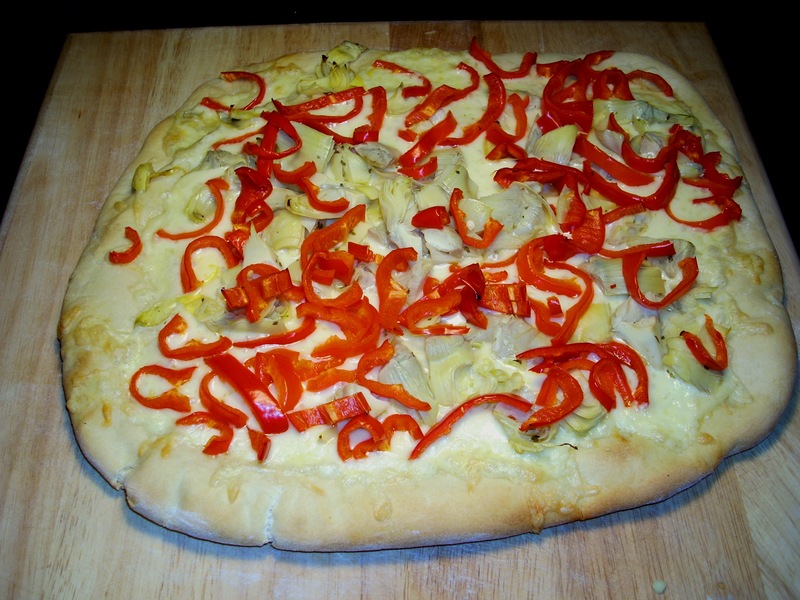 Put cheese, artichokes, and peppers on top of pizza dough. Place back in the oven (you didn’t shut it off did you?) and bake for another 10 mins. Remove, grind some pepper on top, cut, and eat! Previous Post Weekend in DC!